This small vacuum is saving me a few dollars on cleaning services. It goes everywhere I need to eliminate all hair and dust balls from the floor. I use it on my tiled flooring and to vacuum my dog's hair from the couch. I recommend this product. Vacuum any spot in your house quickly and easily with this cyclonic vacuum cleaner from Kalorik. The charger gives you plenty of power to clean messes without a cord in the way. I have owned several Dyson cordless vacuums some costing more than double the Kalorik. My last Dyson died in less than a year. Decided to give this "dyson look" cordless a try. Love it! Does a great job + you can adjust to run with or without roller motor for floor + carpet. This is a bit heavier than my Dyson cordless but it works just as well. I'm pleased with it. I do wish it came with a few more attachments. The suction is good. It just doesn't pick up well. Takes more energy to use this than to pull out the large vacuum. Works as expected. Good price. Bought this for my wife and she loves it. Makes cleaning after all our cats a breeze. 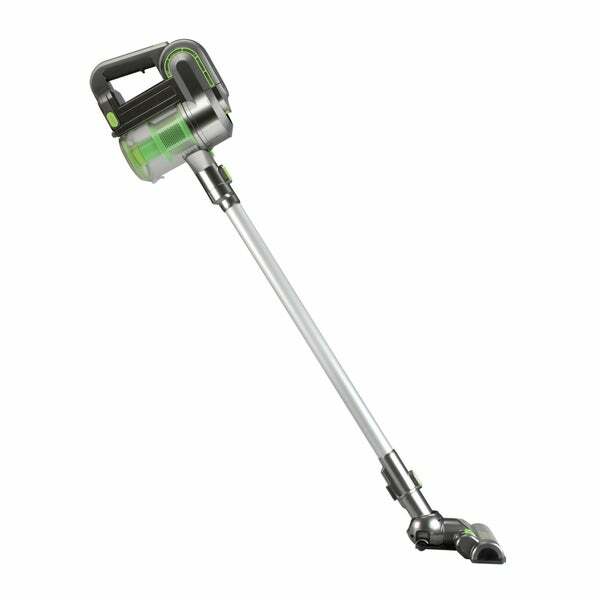 "I just ordered this vacuum love how light weight it is it does not do the crushed cookies or anything that big but is great for pet hair and other small stuff leaves carpet nice and clean. However my charger and stand do not charge right instructions say the light must stay solid and mine are blinking on both stand and bass of vacuum first day with it so really upset I cant charge it to reuse. "